Lisa and I attended the first ever CatholiCon Expo held in Houston this weekend. With a name like CatholiCon, we knew to expect a younger crowd of techies, with references to Sci-Fi shows. (Although we didn’t expect one presenter to actually speak in Klingon.) We were also a little surprised by the pronounced traditionalism thread running within this group of 21st century technologically-advanced Catholic social media group. So what worked at CatholiCon? For people who interact via social media daily, we develop friendships and relationships separate from in-person interactions. After connecting online with a semi-regular basis, you feel like you know people, even though you haven’t met in person. CatholiCon, and other CathNewMedia conferences, offer the opportunity to bring people together face-to-face. They allow you to more personally connect with someone you may know from Twitter or Facebook. You network across the room, meeting others that you connect with, you get to know voices, expressions, that allow you to better put real personalities in place of perceived online personalities. In particular at Catholic conferences, you have the opportunity to worship together, to share your common bond of faith, to support one another, build each other up, and express our care for each other sharing the love of Christ. Content Two sessions in particular stood out to me, as evidenced by both my notes and the number of Tweets I tried to send on Saturday. • The first was Fr. Decker’s “Missionary Mindset,” in which he pointed out that the desire to share and pour out our love of Christ and the Fullness of Truth is basic within us, because we are endowed by God with a variety of gifts and talents. It is up to us to discern how the Lord calls us to use those gifts to spread The Word across the digital continent. Fr. Decker urged us to bring a soul to the latest technological developments. He also used the analogy of creating an icon to show us how to prepare our hearts and thought process for our work. • Another session that proved to be thought-provoking and interactive was labeled “Think Tank.” In this session, facilitators encouraged audience participation by preparing and displaying a series of questions on the screen. We were invited to text or Tweet our “vote.” Most of the questions involved the role of social media and technology in the church and parish today. For example, “Does social media have a place in ordinary parish work?” Predetermined choices included “Only in youth and young adult apostolates,” “Not really,” “Administrative organization only,” and “Too soon to tell.” Many viewpoints were offered and discussion flowed easily both in person and on Twitter. Father Z. pointed out that technology has already changed and impacted church history over the millennia. From oral tradition, to written scrolls, to codex, to printed books: what was once considered “revolutionary” at the time evolved to become normal in another. He reminded this high-tech, social media crowd the value and necessity of unplugging occasionally to encounter the living God. Worship Lisa and I arrived Friday evening mere moments into the Solemn Chanted Vespers. This was a new experience for me that I found deeply moving. As a former music major, I know and appreciate the history of the Gregorian Chant, but I've never heard them presented in this way. The beautiful Latin prayers seeped into my soul through the tonality and harmony. My only regret is that because we were late, we didn’t receive our program with the printed responses and I couldn’t vocally participate, only witness and be moved. Other worship opportunities included Saturday’s Mass in the Extraordinary Form, Afternoon Prayers, Sunday Lauds, and Mass in the Ordinary Form. We do what we do because we feel called to spread the word and be witnesses of Christ’s influence in our lives. We know it isn’t for accolades or number of hits, retweets, etc. and if we ever do become fixated on those affirmations, we must humble ourselves and discern whether we’re doing God’s work or selfish work. However, as human beings, the desire for affirmation that our work is being received is a powerful presence. In addition to the friendships and encouragement we receive from fellow CathMedia evangelists, the Catholic New Media Awards provided that affirmation to a number of nominees and recipients. Room for Improvement This was CatholiCon’s first year. As someone who has managed regional conferences in the past, I know how overwhelming the work and organization can be when creating, planning, and managing a conference of this size. Here are my ideas for improving the 2012 CatholiCon. Schedule The website advertised three sessions each, divided into a Technology Track and Content Track. Saturday, word quickly spread that one session on each track had been cancelled. We did not realize in advance that these sessions would be repeated (morning/afternoon) allowing us to attend all four. The prepared schedule needs to include the order, time, and room location where each session will be held – and start on time. More than once, we found ourselves wandering up to someone in an official CU shirt (or CU priest) asking what would be offered next and when. A few of the session presenters appeared not know who their audience was, speaking either too broadly or too focused. 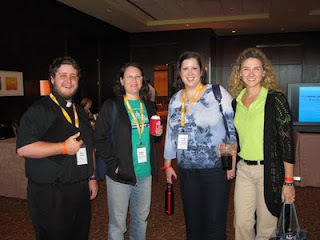 CatholiCon organizers need to discern is CatholiCon predominately for experienced techies feeling a call to spread the Gospel, parish staffers wanting to dive into the social media venue, or writers trying to move beyond the blog and create a sense of community. The session content and promotion needs to be on target for the audience. At least twice, the session content didn’t always match the program description. Also, a wider variety of keynote speakers would be beneficial. Father Z. spoke Friday night, Saturday dinner, and Saturday evening. 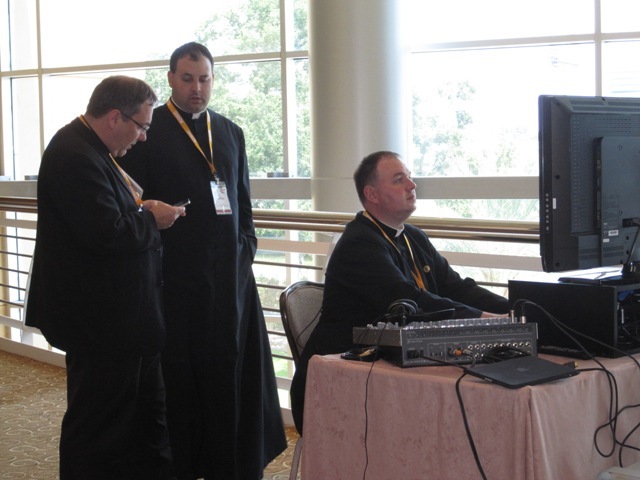 Even though we are not supposed to seek affirmation and recognition for our work, the fact is that by creating and promoting the Catholic New Media Awards for the past eight years, the organizers generated some interest in who would be recognized for their hard work. I don’t know whether these awards were announced in person or online only in the past, but I hope next year the award announcements receive a little more notice. Nominees should be named (if the list isn’t too long) and winners recognized properly, allowing those present to stand up and be noted. Prepare the website, linking to the winners, in advance and have it ready to go live within an hour of the presentation. When I read the promotion for CatholiCon Expo, I expected a large room of vendors including Catholic publishers, Catholic gifts, Catholic organizations, co-mingled with technology vendors, Apple vs. Microsoft, etc. This year’s selection lacked a true “Expo” experience, though I made a purposeful effort to visit with each of the vendor tables who did attend and purchase one or two items. As CatholiCon develops over the next year for 2012, I expect organizers will better identify and determine their targeted audience, firm up their session content, determine a presentation style for the awards, and expand on the goal for an “Expo.” I look forward to seeing this conference really come together and support the Catholic New Media community.